As the Australian property industry continues to debate the effects of an influx of Chinese money, the UK is grappling with much larger flows that are reshaping the face of London. Across the city, the biggest projects are all the work of Chinese developers who developing buildings of unprecedented size and luxury. 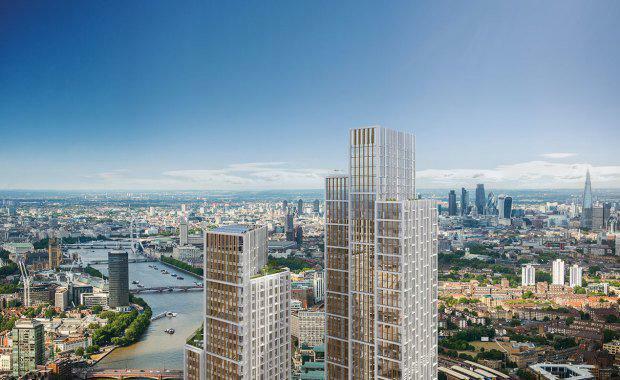 China’s biggest developer Dalian Wanda has already begun work on one such project in central London, One Nine Elms, a pair of residential towers of 58 and 43 storeys on the south bank near Vauxhall. One Nine Elms[/caption]Dalian Wanda is the company that is building the spectacular three-tower residential development Jewel on Queensland's Gold Coast for $970 million. Wanda Group's Jewel proposed highrise on the Gold Coast. [/caption]Masterminded by Wang Jianlin, the country’s richest man, who has a personal fortune of $60 billion, the London project’s vision is just as ambitious. It will be the first residential tower in the capital with its own five-star hotel, where occupants can enjoy room service in the comfort of their own homes, along with a cinema, gym and a luxury KTV karaoke room – a feature that makes a direct appeal to the Chinese market, where at least 30% of buyers are based. The Shanghai-based developer Greenland is another Chinese developer familiar to Australians that is planning major developments in London. Its key projects include a residential development - Ram Quarter - on the eight-acre site of the former Ram Brewery in Wandsworth in south west London, and what could be the tallest apartment building in Western Europe at Canary Wharf. Ram Quarter[/caption]Greenland, which is owned by an arm of the Shanghai city government, is the company that teamed up with James Packer’s Crown Resorts to win the right to develop the multi-billion-dollar Queens Wharf casino, hotel and apartment project in the Brisbane CBD. Queens Wharf Casino[/caption]Hertsmere House at Canary Wharf will rise to 67 storeys reaching 241 metres, if it receives planning permission, putting it at the same height as One Canada Square, the tallest building in Canary Wharf. Its 869 apartments will be some of the most expensive in London. Hertsmere House[/caption]Property experts told the UK’s Guardian newspaper that the wave of Chinese investment in London’s property market was caused by a series of factors including the slowing Chinese economy, the freeing up of Chinese rules on investing overseas, and the prestige of having projects in London. “The top Chinese developers are being driven by challenges in the domestic market and global branding needs,” Eric Zhao, a Chinese markets specialist at Savills, told the Guardian. The Chinese government is believed to have loosened restrictions on overseas investment to prevent local developers fueling the overheated Chinese property market. Chinese developers are not just operating in London’s residential property market, but also in industrial and commercial property. Chinese business park developer ABP is finalising a $3.65 billion plan for east London’s Royal Albert Dock. Royal Albert Dock[/caption]It plans to build 4.7 million square feet of office and retail space across the site which it will market to Chinese companies looking to open UK headquarters. All in all the frenetic activity shows that Chinese developers are not particularly targeting Australia but are active in multiple overseas markets as they seek to find new destinations for their capital beyond the Chinese property market.